Come for the jerk, don't mind the sweat. This place consistently gets 5-star reviews despite its unconventional kitchen and set up, but once you taste their food, you'll know exactly why. At Scotchies in Ocho Rios on Jamaica's northern shores, you can watch unsmiling, soaked-with-sweat cooks labor over giant, smoking slabs of giant, smoking slabs of jerk pork and crispy mounds of jerk chicken. I'm a huge fan of spicy Jamaican jerk, particularly at nondescript roadside joints like this one, which is the original Scotchies location; others are in Montego Bay and Kingston. 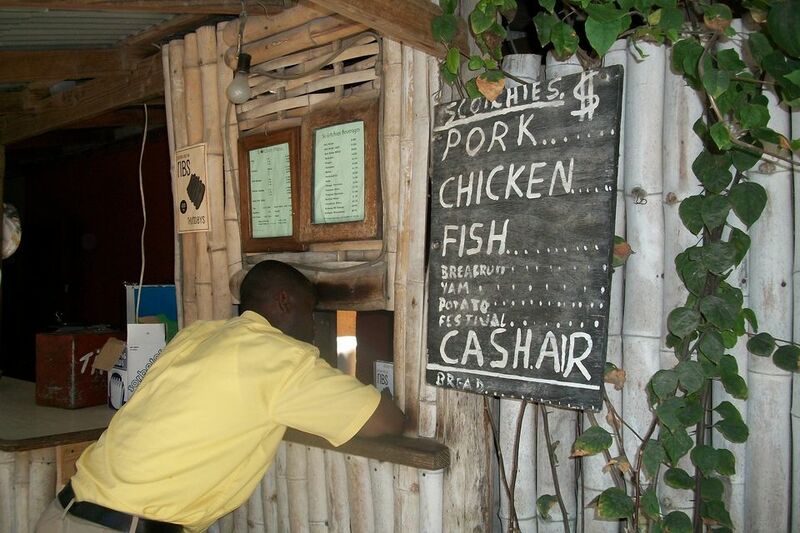 This is a classic country eatery serving typical, genuine and drop-dead delicious jerk chicken and pork. Whole chickens and giant slabs of freshly butchered pork, all heavily doused with jerk sauce and spices (and OK, maybe a little sweat) are heaped on pimento or dogwood logs and smoked over the fire below, all of it topped with giant, well-used panels of corrugated metal to keep the smoky flavor in. That magical jerk smell fills the dark, dingy smoking room -- the working kitchen is open for public gawking, particularly from Americans not used to the sight. Locals abound and make up the bulk of the clientele, the surest testimony to the quality of any Caribbean restaurant. There are long lines at busy times; we caught a Saturday afternoon lull and were seated and served swiftly. There's a great open-air bar here to pass the time as well; take time to sit and sip with the locals and try to decipher their lilting patois. When your meal is crisped up dark and moist, the cooks yank it off the fire and pull it apart, apportioning various quantities of the steaming, aromatic meat to plates and platters and giant aluminum pans. Diners feast in one of several huts on the garden-like grounds, sitting on heavy, handmade stools of sturdy local wood and occasionally being pestered by a feral cat or stray dog. Jerk is wonderfully spicy food, and you're welcome to add fuel to your culinary fire with the accompanying scotch bonnet sauce. But beware: This locally popular cousin of the habanero is one of the hottest peppers on the planet, so a little goes a long, burning way. Try a small dose at first and wait for it to infuse your lips and face with its spreading warmth before loading up on more. A Red Stripe beer or two or three or more is a nice counter to the pepper's mounting heat, just be prepared for some eyebrow sweats. Our group had giant portions of pork and chicken and wolfed it down to the bone in no time, gorging on the succulent, moist, flavorful meat that was accompanied by generous baskets of Jamaican festival bread -- braided tubes of cornmeal batter deep fried to a golden brown. We also had roasted breadfruit, a Jamaican staple, slathered with fresh butter, and roasted sweet potato, different from its American counterpart in that it's harder, chewier, stringier -- and incredibly good. And you get all this on the cheap: At the time of our visit, a full pound of pulled pork was a mere $14 American, and a whole pulled chicken about $12. The sweat of its preparers? No extra charge. Hours: Monday-Saturday, 11 a.m. to 11 p.m., Sunday 11 a.m. to 9 p.m.